Well, we are now almost halfway through the month of February, and I am looking forward to discussing some of The Mystery of Providence with all of you who are reading. For the month of February, RHB has once again sponsored a giveaway to be done at the end of the month. As you can see below, this month’s giveaway exceeds a retail value of $80! I am very excited about this and look forward to seeing these books become useful resources in the hands of God’s people. Here’s how it will work this month: On Friday, Feb. 29th, I will post an open thread for everyone who has read The Mystery of Providence to share your thoughts about the book, primarily answering the question, “How has this book been useful to you personally and/or ministerially?” The purpose I have in mind is that we remember the “uses” of the doctrines we are learning together–that there is no doctrine that does not have application. The post will remain throughout the weekend, giving everyone plenty of time to respond. On Monday, I will do the random drawing (computer generated) out of the responses given in the comments of the open thread (post). Once the winner is notified privately, I will make that public here at P&P. Here are the books that will be given away this month. Be sure to check them out! From an Amazon Reviewer: I have said to my students that if I were locked away for the rest of my life and could only have 3 books with me, I would take my Bible, Calvin’s Institutes and Keeping the Heart. 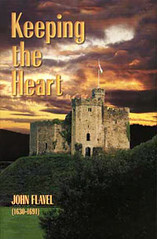 Flavel’s “Keeping the Heart” is, in my opinion one of the best books written since the close of the Apostolic age. Flavel is a man who walked with his God – you can sense that as you read. I think this is the most important and also most ignored aspect of the whole of the Christian life: The keeping and right ordering of the heart. Flavel shows that heart work is not only the most important but also the hardest work. THIS heart work is what separates those Christians who go about their business for decades without giving thought to their hearts and those who commune with the Lord in all that they do. Read this book Christian! You will be so blessed. Retail: $19.95. Description: In The Inner Sanctum of Puritan Piety, J. Stephen Yuille demonstrates how the doctrine of the believer’s union with Christ lies at the heart of the Puritan pursuit of godliness. He analyzes the whole corpus of Flavel’s writings, showing how this mystical union is set upon the backdrop of God’s covenant of redemption and established on the basis of the person and work of Jesus Christ. 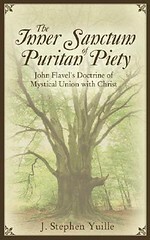 Chapters on the nature and acts of this union help readers gain a better understanding of what this union is, while chapters on the blessings, fruit, suffering, evidence, joy, practice, and hope associated with this union, show more fully the experiential direction of Flavel’s approach to theology. Retail: $12.00. Description: Like his Puritan colleagues, Sedgwick was a wise observer of providence. 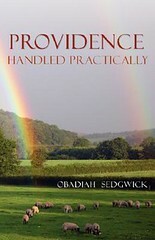 In “Providence Handled Practically,” he shows how the over ruling hand of God should be considered as it comes to bear on the life of the Christian and the church. After briefly explaining the words of Matthew 10:29-31, he distinguishes between God’s general and special providence. Then follows an extensive discussion of the practical use of this doctrine. This edition has been edited for modern readers and has an introductory essay by Joel R. Beeke and Matthew Winzer. Retail: $14.00.